One day after Japanese slugger Shohei Ohtani chose to play for the Angels and in turn kicked off the 2017 MLB offseason, we have our second piece of big news. Giancarlo Stanton, who was linked to both the St. Louis Cardinals or the San Francisco Giants for the last few weeks, reportedly has been dealt to the New York Yankees. The clubs have not yet confirmed. Stanton, who has a no-trade clause, limited his trade options earlier this week to the Yankees, Los Angeles Dodgers, Chicago Cubs, or Houston Astros. Rather unsurprisingly, the Derek Jeter-led Marlins agreed to trade Stanton to the Bronx for Starlin Castro and prospects. Here’s my take. Giancarlo Stanton, who plays right field, has gained a notorious reputation in the MLB for hitting an absurd amount of home runs. Just last year, Stanton blasted 59 (!) home runs for the Marlins. He has hit 267 dingers in his seven seasons in Miami, and has hit for a .268 average throughout those seven years. Stanton is entering his age 29 season, and carries a massive contract, where he will make north of $25 million dollars (!!) for the next 10 (!!!!) years. This is a huge burden added to an already humongous Yankees payroll. 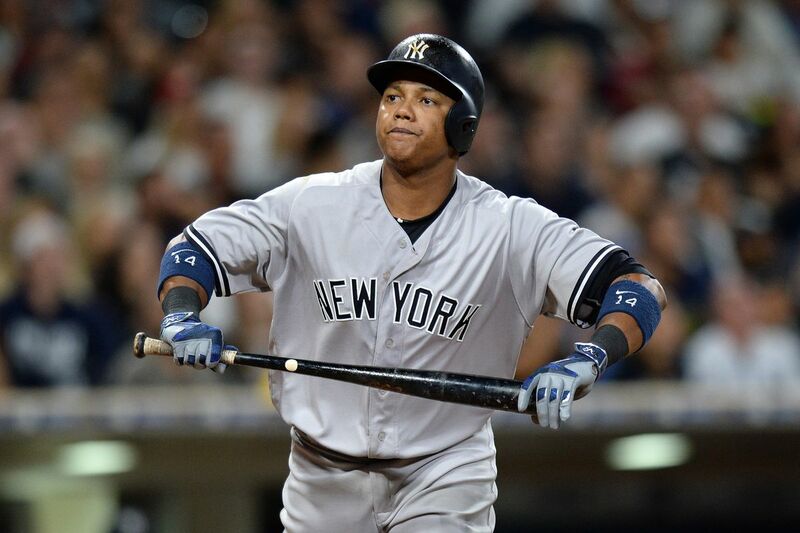 Starlin Castro, who the Yankees reportedly gave up for Stanton, is a contact hitter. Castro, in eight seasons with both the Cubs and Yankees, has hit 99 home runs and has hit for a very solid .282 average. He mimicked those stats in the 2017 season, hitting 16 homers and sporting an even .300 average. Both of these players add something to their respective teams. I have a different take on this trade. As Nats fans, the single most important event of 2018 will be the free agency of Bryce Harper. Harper is a generational talent, and like most generational talents, he has been linked to the New York Yankees. In 2009, when he was featured in Sports Illustrated, he said, “I want to be in the Hall of Fame, play at Yankee Stadium, play in the pinstripes, and be the best player ever.” Now while this was 2009, almost ten years ago, Harper seems as if he would love to play for the New York Yankees. After the trade for Stanton, the Yankees would likely be unable to offer a mega-deal to Harper too. With a stacked outfield including Stanton, Aaron Judge, and Jacoby Ellsbury, there might not be space on the field or in the wallet for the Yanks. However, this is a great deal for the Yankees. After shocking the league by making it to game 7 of the ALCS, the new-look Yankees will be poised to return to the bright lights of the World Series. And they will have two of the strongest players in the league, with Aaron Judge and Giancarlo Stanton batting in the same lineup. I’m just glad that they don’t have to sport such a dangerous lineup in the NL! As a fan of the game, I’m really looking forward to May 15, when the Yankees come to D.C., but fear the results on the scoreboard. After these two big trades, the upcoming Winter Meetings are sure to be full of interesting deals and blockbuster free agent signings. We’ll see what the future holds for baseball. The big fish has been caught. In a move that sent shockwaves across Major League Baseball, Shohei Ohtani made his decision to “take his talents” to the Los Angeles Angels. The Japanese 2-way player chose to play in Anaheim with Mike Trout and the Angels on Friday, with his agent citing that he “felt a strong connection with the team, and are the most capable to achieve his goals in Major League Baseball.” Here are my thoughts about the signing. Here’s some background information about Ohtani, if you need a refresher. He is a 23-year old, can play both outfield and pitcher, and is the most highly touted Japanese prospect since Ichiro Suzuki. 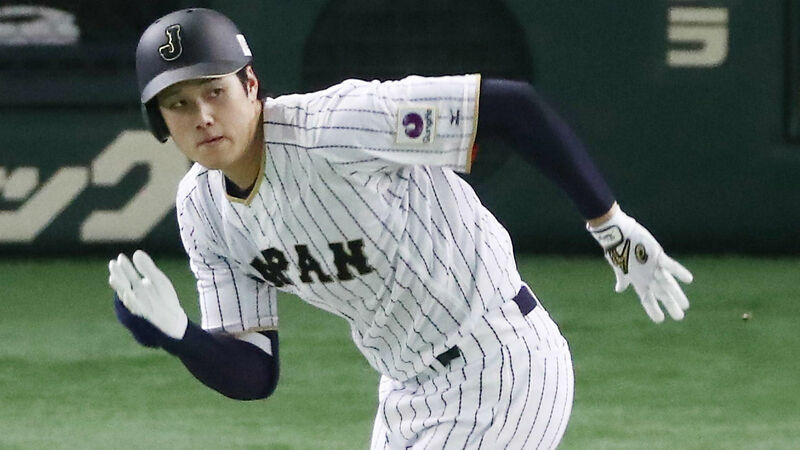 Ohtani has played for the Hokkaido Nippon Ham Fighters for the last five Nippon Professional Baseball (NPB) seasons. At the plate, Ohtani has hit .286 and hit 48 home runs in his five seasons at the top level of Japanese baseball. He might even be more impressive on the mound. In the same five seasons, he went 42-15 and posted a a 2.52 ERA. To put his stats into comparison, Trea Turner hit for a .284 average during the 2017 MLB season. The real question most people have about Ohtani’s big switch from the NPB to the MLB is how he will perform on the field, and how the Angels will be affected by the signing. The Angels have some amazing talent on their team, including Mike Trout, Andrelton Simmons, and Kole Calhoun. While they have Garrett Richards and Matt Shoemaker, the pitching staff of the Angels was really lacking in the past season, causing the Halos to finish the season two games under .500. Giving the Angels an ace to strengthen the pitching staff is huge. On days where Ohtani isn’t on the mound, he can take advantage of the designated hitter rule and solely bat. He also can fill in for the Angels’ already impressive outfield and play there. Secondly, I believe that Ohtani will have some struggle at first, because the MLB can be much more competitive than the NPB. When Ichiro first entered the Majors, he had a major drop in his batting average. Masahiro Tanaka, another international free agent, had his ERA shift from 1.27 to 2.77 after he made the jump. Even so, he will add something to the Angels that they don’t currently have. I support the signing of Ohtani by the Angels. In a highly competitive AL West division including the reigning World Series champions and the new-look Mariners, the Angels needed to make a splash like this one to virtually stay in the hunt for a playoff spot. I believe that the Angels will be competitive in the race this year, and possibly obtain one of the two wild card spots. With the Winter Meetings still yet to occur, the stove has just started to heat up. The crazy 2017 offseason has begun. Last Saturday night, I did something I don’t normally do – I wore a rented tuxedo. Lucky for me, it was for a great cause, the annual Nationals Dream Gala. Every year, the Washington Nationals and the Nationals Dream Foundation present the Nationals Dream Gala. The Dream Gala is one of the benchmark events that the Nationals have during the regular season, even when they aren’t chasing a World Series title. The Nats are the only team in the NL East with a charitable, black tie event like this. First of all, let me tell you a little bit about the Nationals Dream Foundation. Established in 2005, the mission of the foundation is to “improve the lives of children and teens by supporting initiatives focused on academics, the arts, nutrition, and sports.” The Chairmen of the Foundation include members of the Lerner family, Debra Cohen, Mark Lerner, Marla Lerner Tanenbaum, and Ted Lerner. The Foundation supports many charitable initiatives, including the Nationals Legacy Fields, the Nationals Miracle Field in Germantown, Delta Dream Grants, the Washington Nationals Diabetes Care Complex at Children’s National Medical Center (Nats players visit every year), and the Washington Nationals Youth Baseball Academy in Southeast. The Dream Gala is held to raise money for the Dream Foundation. I was invited to the Dream Gala by my amazing doctor at the Diabetes Care Complex at Children’s National Medical Center, Dr. Fran Cogen. Dr. Cogen is so helpful to my family, guiding us through the tough, unpredictable waters of Type 1 Diabetes. Dr. Cogen is not only the head of the Diabetes Care Complex, but she’s also a huge Nats fan. How lucky am I that my doctor and I share a love for the Nats! The Dream Gala consists of two parts — the cocktail hour/silent auction, and the dinner/live auction. What I liked the most about the cocktail hour was that the players also walk around, mingling with the fans who are bidding on the silent auction items. The silent auction items were pretty cool, also. My favorite item had to have been a picture of Max Scherzer at his 20 strikeout game autographed by the man himself. A close second was a zamboni ride at a Caps game. I was able to meet many of the players, some that I hadn’t met yet. I took pictures and chatted with Adam Lind, Anthony Rendon, Tanner Roark, and Dusty Baker. Dusty told me that he intends to win the World Series this year — and I gave him a high five for that! I also caught up with some players, like Ryan Zimmerman, that I had met before. Ryan told me that he would keep up his hot streak so that I would have things to write about. Sounds good to me! I also got Trea Turner to autograph a ball! After about an hour, it was time to go into another room where dinner was served. After we all had exited the room with the silent auction, we took our seats at our tables around the room. Some tables had a player, coach, or broadcaster sitting at the table. Before the players came to their tables, though, they were introduced by the Nats’ PA announcer, Jerome. Oliver Perez did his best Project Runway model walk while he was walking down the stage, which was really funny. After we ate, the live auction began. There were some really cool experiences in the live auction, including a trip to Jamaica, a chance to travel with the Nats on their trip later this month to St. Louis on the TEAM PLANE (it went for $30,000), and my personal favorite, 2016 All-Star Game memorabilia and tickets to both the Home Run Derby and All-Star Game in 2018. It was painful for me to watch that one go by, even though it was sold for $10,000. The unique and cool experience that I had at the Dream Gala is something that is going to be very hard to replicate in the future. The Gala was a success to the Dream Foundation, as well — they were able to raise north of $400,000 for the Dream Foundation. I think that the Nationals did a great job with this event, and I think that it is a great way to raise money for the Dream Foundation. To support the Washington Nationals Dream Foundation, click here. MLB Season Predictions- My Take on 2017! I think we can agree that winter is over and spring is finally here. Not because the weather is finally constantly warm, but because baseball season begins today. On Opening Day, we look forward to162 games packed into six or seven months, and then, come October, only 10 teams will get a chance to claim victory. Today I continue the annual tradition of giving you my thoughts about the 2017 MLB season and the postseason, and making my prediction about who will be the first MLB team to visit the White House under the new administration. After a few years of dominance in the western part of the AL, the A’s have really dropped off. They do have some up-and-coming bright spots, however. They signed former Giant Santiago Castilla for their bullpen, to go along with Sean Doolittle, another dominant piece. Stephen Vogt’s name has been swirled in trade rumors for awhile now, but he remains in Oakland for now and is a very good player to have backstopping the A’s. Khris Davis is also a dangerous hitter, who should put up strong numbers this year. The Oakland faithful have a couple of names to cheer for, but with not so much starpower and an aging stadium, I don’t believe the Athletics will be around much longer, no way making the playoffs. The Angels were serious contenders in the AL for many years, but last year, the team was one of the biggest disappointments in the league. Obviously, the Angels have Mike Trout, arguably the greatest player in the league right now. He will make noise offensively and defensively like he does every year. Other than Trout, however, the team is lacking. When they take on the Washington Nationals for interleague play, it will be like a family reunion with 3 former players (4 if you count farm systems). Danny Espinosa, traded to the Halos this offseason, will play second base next to Andrelton Simmons, former Brave, who always puts up stellar defensive numbers. Ben Revere will likely back up Trout when he needs a day off. Yunel Escobar will be playing at third base to cap off an infield that is 75% former NL East, with Albert Pujols being the odd man out. Pujols will put up good numbers as usual, but it’s very clear that he no longer is the player earlier in his career with the Cardinals. (He’s still a future Hall of Famer). Garrett Richards will be back for the season after being out for much of last campaign. He will rejoin a pitching staff with Matt Shoemaker, Ricky Nolasco, and Tyler Skaggs. But this team is on the decline. LA fans luckily have 7 other sports teams to root for this coming season. The Mariners are a really good team, and I expect them to contend for a Wild Card this season. However, this team can’t mess with Texas, as I predict they will finish third. There are some major bright spots to this team. Kyle Seager is an amazing third baseman, and Robinson Cano will also add offense. Nelson Cruz can also hit very well with his boomstick. They’ve got Carlos Ruiz behind the plate, who is a very solid hitter. Felix Hernandez will continue to be one of the best American League pitchers, followed in the rotation by Hisashi Iwakuma, Yovani Gallardo, and James Paxton. In the bullpen stands Marc Rzepczynski and Edwin Diaz. Diaz finished last year very, very strong, almost leading the Mariners to a wild card position. So while this team will be very good soon, I don’t believe they will ascend to first in the AL West next year. WHAT!! The Rangers in second? I know it sounds crazy, but I don’t think the Rangers will have as good of a year as they did last year. Still, a playoff spot is almost guaranteed for our friends in Arlington. Assuming he can keep his hands to himself, Rougned Odor will have a good year. Joey Gallo, a highly touted prospect for a few years now, hopefully will eclipse into a serviceable third baseman to replace the aging Adrian Beltre. But for the time being, Beltre is still a great player to have. Carlos Gomez, Nomar Mazara, and Shin-Soo Choo will be great outfielders next season. And of course, they have Jonathan Lucroy behind the plate, who they acquired from the MIlwaukee Brewers last season. Cole Hamels will take the nod on Opening Day, followed by Yu Darvish, Andrew Cashner, and Tyson Ross. And in the bullpen of the Rangers, Keone Kela, Sam Dyson, and Jake Diekman will likely shut down hitters. Don’t get me wrong, the Rangers are really good. I just think it’s now the Astros turn for a division. The Astros will finally eclipse (see what I did there) the A’s and Rangers in the West and finish first in the American League West. After an off year, Dallas Keuchel will return better than ever. The rest of their rotation, led by names such as Collin McHugh, Charlie Morton, and Brad Peacock, is solid. They have a very nice infield, with Jose Altuve and Carlos Correa leading them. They have some very promising prospects like Yulieski Gurriel, A.J. Reed, and Alex Bregman. Brian McCann will give some extra offense as well. George Springer and Jake Marisnick will welcome signee Josh Reddick to Houston in the outfield. The young roster will finally get the Astros, after a very long rebuild, into the playoffs and a win of the AL West. Hoo boy, you really have to feel terrible for San Diego. They just recently lost their Chargers to Los Angeles, and their Padres, now the city’s lone sports team, isn’t a very exciting team to watch. (Good news, though, for Padres fans, they have my favorite ballpark in MLB!) The pitching staff is unexciting, with some minor signings of players like Tyrell Jenkins barely making their situation better. The bullpen is so-so, with Kevin Quackenbush and Carter Capps being the heads of the ‘pen. The loss of Trea Turner really hurt their offense, but they still have Wil Myers, Yangervis Solarte and up-and-coming outfielder Hunter Renfroe. Ryan Schimpf had a few good weeks last year, so he should be good for this year as well. Other than that, the Padres are pretty unexciting. On paper, the Diamondbacks team is actually not so bad. They are led by first baseman Paul Goldschmidt, have a solid outfield led by A.J. Pollock making a return for this year, Yasmany Tomas, and David Peralta. They have Zack Greinke on the hill. But that is it. The rest of the rotation consists of Shelby Miller, who was acquired in one of the most one-sided trades in history (Miller to AZ for Dansby Swanson and Aaron Blair), Taijuan Walker, Randall Delgado, and Robbie Ray. The bullpen is unimpressive, with no true closer and Andrew Chafin leading the way for the Snakes. The catcher position consists of Chris Iannetta and Jeff Mathis, two veterans added to the squad. After Goldschmidt, Jake Lamb is a fine infielder but the infield isn’t so great after that. The outfield of the Diamondbacks is fine. However, I don’t think that this team is going to perform, whereas on paper this team would do great. The Rockies are a very offense-driven team and could possibly contend for the 2nd spot in the west. But first, they need to upgrade their pitching staff. Jon Gray and Jordan Lyles are the leaders of the sub-par rotation in Denver. And you can’t really have a rotation that isn’t great when you are playing 82 games a year in a ballpark in which the ball carries due to the thin air in the city. The bullpen is very nice, with new acquirees Mike Dunn and Greg Holland joining Jake McGee in Colorado. They don’t have a solid catcher, another weakness for their team. But it’s offense where the Rockies thrive. It’s a vital piece to their performance, especially because they play in a ballpark where the ball carries so much. Nolan Arenado, Ian Desmond, Trevor Story, and DJ LeMahieu are all very good hitters. They also have franchise player Carlos Gonzalez and Charlie Blackmon in the outfield. This team could possibly have a breakout year and make the playoffs. A very deep team, the Giants will make the playoffs, I predict, as a Wild Card team for the second straight year. Madison Bumgarner will lead the rotation for the Giants, while Johnny Cueto, Jeff Samardzija, and Matt Moore follow him in the rotation, making it very solid. The bullpen could be better, but the Giants scored Mark Melancon to close down games at McCovey Cove. Fastballer Hunter Strickland will now move into a 7th-8th inning role for the Giants. Buster Posey will, obviously, be a very solid offensive piece for the Giants. Brandon Belt, Brandon Crawford, and Joe Panik will provide solid defense and offense for the Giants this year, and the outfield consisting of names like Denard Span and Hunter Pence still shines. The Giants are a good team, but I do believe that they are not the elite team they seem to have every “even” year in San Fran. The Dodgers are almost a lock for the first spot in the west. They have an amazing rotation, led by Clayton Kershaw but featuring other names like Kenta Maeda, Rich Hill, and Julio Urias. The Dodgers signed Kenley Jansen back to keep their bullpen stacked, with Pedro Baez and Yimi Garcia getting bullpen innings this season. On offense, the Dodgers have reigning NL Rookie of the Year, Corey Seager, now in his sophomore campaign. Adrian Gonzalez and Justin Turner, like always, will be threats at the plate. Chase Utley is back for another year, closing out a very impressive infield. In the outfield, the Dodgers lost A.J. Reddick, but still have Yasiel Puig, Joc Pederson, Andre Ethier, and Trayce Thompson (the brother of Klay Thompson of the NBA’s Warriors). It’s pretty much certain that the Dodgers will win the division with the lineup they have, even possibly a World Series. In two of the blockbuster trades we saw this offseason, the White Sox traded stars Chris Sale and Adam Eaton away from the South Side. Who did they get back? Prospects, prospects, and more prospects. Did I mention prospects? I really would be surprised if the Charlotte Knights (AAA) don’t win the Governor’s Cup this year. James Shields will lead the dismantled Sox in the rotation, then Jose Quintana, likely followed by Lucas Giolito and Reynaldo Lopez, who were acquired from the Nats in the Eaton deal. Derek Holland might also score a rotation spot. Jake Petricka and David Robertson are the leaders of the White Sox’ bullpen this year. Omar Narvaez will be the White Sox starting catcher. The infield will be fine, as the South Siders did keep a few key pieces like Jose Abreu and Todd Frazier. Yoan Moncada, acquired for Sale, will make a huge impact in his first full season after riding the bench in Boston when he wasn’t in Pawtucket. Melky Cabrera is the only household name in the White Sox’ outfield, not a good sign. They will not do very good on the field, thus they should start scouting for next year’s draft. Oh God, the Twins were awful last year. But with the departures of Chris Sale and Adam Eaton from the rival White Sox, the Twins won’t be as terrible as they were last year, and, I predict, will slide into the #4 spot in the AL Central. Hector Santiago, Ervin Santana, and Phil Hughes headline a sub-par rotation, but they have up-and-coming stars like Alex Meyer, Kyle Gibson, and Trevor May. The Twins actually have the second most underrated reliever in the Bigs (behind Jake McGee of COL) in Glen Perkins, who is a perennial All-Star in the Twin Cities. Other than Perkins, the Twins don’t have such an exciting bullpen. Matt Belisle will be an important piece to the Twins’ bullpen this year. Jason Castro, acquired in free agency after a long tenure with the Astros, will join the Twins at catcher, being backed up by former Yankee John Ryan Murphy. The infield for Minnesota isn’t that bad, with former star Joe Mauer leading the way at first base, Brian Dozier at second, and up-and-coming power hitter Miguel Sano at third. Kennys Vargas will take the shortstop position come Opening Day. Byron Buxton, once dubbed the best prospect in all of baseball, will likely split his time between Minneapolis and Rochester of AAA. Max Kepler is a very good outfield piece for the Twins to have, and should light up pitchers like last year. Were the Royals pretenders during their two consecutive World Series runs in 2014 and 2015? It sure looked like that last year. The Royals don’t have a true pitching star after losing Johnny Cueto to San Francisco in free agency last year. But Chris Young, Jason Hammel, and Danny Duffy create a passable rotation. The bullpen, like many ones in the AL Central, has an underrated reliever in Kelvin Herrera. The fireballer should have another great year for the Royals. Joakim Soria is another nice option for the Royals. Catching-wise, the Royals have Salvador Perez, who should create offense for KC this year. Eric Hosmer is always a threat offensively, and coming off a World Series and an All-Star Game MVP, he should be a huge force for the Royals this year. Alcides Escobar is always a speed demon. Speaking of speed, Terrence Gore and Lorenzo Cain create a filthy defense in the Royals’ outfield. I should also mention that they also have Billy Burns, who was drafted by the Nats and got an elusive “80” rating from Nats scouts for pure speed. They also have Alex Gordon, and his stellar defense will be great for Kansas City. But unluckily for them, the young Tigers and Indians are going to be better teams than the Royals this season. It would be very, very hard for a team like Detroit to dethrone the reigning Indians as champs of the AL Central. However, Detroit, like many other AL Central teams, has a very underrated roster. Obviously, they signed Jordan Zimmermann before the 2016 season, who bolsters their rotation alongside Anibal Sanchez. Two young studs, Daniel Norris and Michael Fulmer, make the rotation above average. Oh, and you can’t forget former Cy Young and MVP winner Justin Verlander, who made a great comeback last year after a below-average 2015. K-Rod (Francisco Rodriguez) is the main piece in the bullpen, which is not very strong compared to rivals in Minnesota or Kansas City. Alex Avila will suit up for another year backstopping the Tigers, backed up by James McCann. Ian Kinsler, Miguel Cabrera, and Jose Iglesias are the main pieces to a solid infield for the Tigers. Justin Upton and J.D. Martinez make up the main part of the team’s outfield. I really like the Tigers’ team, but with the Blue Jays, Rangers, and Orioles also competing for a Wild Card position, I believe that the Tigers will barely miss out on a playoff spot. The Indians showed incredible resilience in Game 7 of the World Series (obviously which they ended up losing in 10 innings), and are poised to get the title to Believeland this year. Corey Kluber is probably the best pitcher in all of the AL Central, which gives the Indians a giant boost in divisional play. Josh Tomlin and Trevor Bauer will also put up quality starts this year, only if Bauer doesn’t fly his drone excessively. Andrew Miller will be a lockdown reliever for the Tribe this year, something that will be vital to their success. Roberto Perez, who made a name for himself last year in the playoff run, will start behind the plate. The infield is very good, with Jason Kipnis at second, Francisco Lindor at shortstop, and Jose Ramirez at third. Edwin Encarnacion will take over duties at first base after being signed by Cleveland, making their championship chances even higher. Michael Brantley and Lonnie Chisenhall bolster the outfield, with up-and-coming center fielder Tyler Naquin also a threat. They also have Carlos Santana at the DH position. They are a great team that has a chance to win this year. The Brewers team that GM David Stearns has put together isn’t looking so spectacular this season. Jimmy Nelson and Junior Guerra lead the rotation, one that doesn’t look great. The bullpen will consist of Neftali Feliz, and well, nothing really else. Andrew Susac is the starting catcher for the Brew Crew, and he will provide some extra offense as well. Scooter Gennett and Jonathan Villar are the captains of the infield. Their offensive ability will help out the Brewers a lot. Ryan Braun and Keon Broxton are the main pieces in the outfield. I don’t see the Brewers making any noise in the NL Central. The Reds will join the Brewers in the cellar of the Central. Tony Cingrani, Scott Feldman, and Drew Storen make up a fine bullpen in the Queen City. Devin Mesoraco will start behind the plate this year for the Reds, after missing a year due to injury. Joey Votto, Zack Cozart, and Jose Peraza make up a solid infield, with Votto leading the way. The Reds’ strength is in the outfield, where Billy Hamilton and Adam Duvall are the main pieces. Obviously, the Reds aren’t going to win the World Series, but I like the direction this team is going in for the future. As a die-hard Washington Capitals hockey fan, I just love talking about how I think a team from the city of Pittsburgh isn’t going to make the playoffs. To be honest, the Pirates actually aren’t terrible, but the Cardinals and Cubs are much, much better than the Bucs. Gerrit Cole is the captain of the rotation and consensus best player in Pittsburgh. He is followed by up-and-coming prospects like Tyler Glasnow and Jameson Taillon. Tony Watson, Jared Hughes, and Felipe Rivero make the bullpen one that is above average. Francisco Cervelli and Chris Stewart make for a great tandem behind the plate. The infield is pretty good as well, with Josh Harrison and young talent Josh Bell leading the way. The Pirates also have John Jaso to play 1st base and Jordy Mercer at shortstop. The outfield is obviously the team’s strength, with perennial all-star Andrew McCutchen and young guns Starling Marte and Gregory Polanco patrolling the outfield at PNC Park. The Pirates have a really good team, but they play in one of the best divisions in all of baseball, and I don’t think that they’ll make the playoffs this season. The Cardinal seem to always play good baseball. So it’s no surprise that the Redbirds will be vigorously competing for a playoff spot this season. Carlos Martinez is the ace in St. Louis, with Michael Wacha and Adam Wainwright following him on the mound. Coming out of the bullpen is Kevin Siegrist, Trevor Rosenthal, and Seung Hwan Oh. The catcher position is filled up by one of the best backstops in baseball, Yadier Molina. The infield is also really good, with slugger Matt Adams, above-average hitter Matt Carpenter, Jhonny Peralta, and up-and-coming Aledmys Diaz. The outfield is just that much better this year, with the free agent acquisition of Dexter Fowler. Randal Grichuk and Stephen Piscotty take up the other two outfield spots. But I think that the Cubs, coming off a World Series championship, are going to be so much better than the Cardinals this year. This is a great baseball rivalry to watch. How do you not pick last year’s World Series Champions to win the Division this year? The Cubs, even after losing Dexter Fowler, are still going to be one of the league’s best teams. They have four elite starters in John Lester, John Lackey, Kyle Hendricks, and Jake Arrieta. They picked up Wade Davis in free agency, and he will be joined by Carl Edwards, Jr. and Mike Montgomery in the bullpen for Chicago. Willson Contreras, who made a name for himself last year, will most likely have the starting catching role come Opening Day, and he will be backed up by Miguel Montero. The Cubs have a scary infield. On the corners, they’ve got two MVP candidates in Anthony Rizzo and Kris Bryant. The middle infield is made up of two all-stars, Addison Russell and Ben Zobrist. The power-hitting (and might I add, young) infield is the reason the Cubbies will go far this year. And even though they lost Fowler to St. Louis, the Cubs still have Jason Heyward, Kyle Schwarber, and Albert Almora in the outfield. They might be the best team in the league, so it’s a consensus choice to say they’ll win the Central. You may want to forget what I said about the NL Central being the best division in the MLB, when it comes to the AL East. The Yankees are America’s spenders, one of the bandwagon teams in the league. You would think that would mean that they have a ton of really good players. But they really don’t. The Yankee team that GM Brian Cashman has put together doesn’t have enough experience to win the Divison. Michael Pineda, Masahiro Tanaka, Luis Severino, and CC Sabathia make up a very solid rotation. In the bullpen, arguably one of the best in the league, the Yanks have Tyler Clippard, Dellin Betances, and Aroldis Chapman leading the way. After a campaign where he finished second in AL ROY voting, Gary Sanchez looks to come back better than ever. The infield is below average, with Chris Carter, Chase Headley, Tyler Austin, and Didi Gregorius most likely starting. The outfield is pretty nice, though, with Jacoby Ellsbury, Brett Gardner, and Aaron Judge. After years of being the league’s oldest team, the Yanks are now one of the youngest. That doesn’t fare well, because they don’t have much experience. The Yankees will fall to the cellar of the AL East this year, I predict. After a, well, disappointing, 2016 season, the Rays have put together a nice team. Chris Archer, the team’s ace, pitched poorly last year. I expect Archer to rebound very nicely this season for the Rays. Jake Odorizzi and Blake Snell are two young starters who should make an impact in St. Pete. The bullpen isn’t great, with Shawn Tolleson likely closing down games for the Rays. They scored at catcher, by signing Wilson Ramos in free agency from the Nats. This will add some much needed offense to the Rays team. The infield isn’t terrible, either. They’ve got Evan Longoria, the franchise player, Logan Morrison, Brad Miller, and Matt Duffy. The outfield actually is pretty good, with Kevin Kiermaier, Corey Dickerson, Nick Franklin, Steven Souza, Mallex Smith, and Colby Rasmus all competing for a job on Opening Day. The Rays team played horribly last season, but they could end up as surprise contenders in 2017. The loss of Edwin Encarnacion is going to hurt the Blue Jays so hard that they will fall down a division spot to third, even with the powerhouse roster they still do have. Marcus Stroman is the Jays’ ace, with Aaron Sanchez, J.A. Happ, and Marco Estrada also giving Toronto some quality starts. The bullpen is average, with J.P. Howell and Joe Smith as the two main relievers, and Jason Grilli closing for the Jays. Russell Martin will again suit up in Toronto as the catcher, giving Toronto strength behind the plate. The infield is pretty darn awesome, with Josh Donaldson and Troy Tulowitzki on the left side, and Ryan Goins and Steve Pearce on the right side. Jose Bautista, Melvin Upton, Kevin Pillar, and Dalton Pompey all are competing for a roster spot, four really solid outfielders. The Jays are just so unlucky to lose a power hitter like Edwin Encarnacion. The Orioles are one of baseball’s most underrated teams. They are very, very good all-around and should definitely make some noise in the AL East. The pitching staff is very good, led by Chris Tillman in the rotation. Wade Miley and Mike Wright follow him in Birdland. The bullpen is one of the best in all of baseball, headlined by Darren O’Day, Brad Brach, and Zach Britton. I am interested to see how Zach Britton performs this year as one of the best closers in all of the game. The O’s bullpen also has Mychal Givens, who I think is going to have a very nice season. Behind the plate, the O’s sport Chris Joseph, the homegrown talent. Expect him to light it up as longtime starter Matt Wieters is now gone. The infield, like last year, will produce a ton of home runs. Chris Davis and Manny Machado are the two main pieces of the Orioles’ infield. J.J. Hardy has been the shortstop for about forever, and the platoon of Jonathan Schoop and Ryan Flaherty will be successful again. Adam Jones leads the outfield that also includes last year’s home run leader, Mark Trumbo, and Korean slugger Hyun-Soo Kim. This is a very solid Orioles team, but the Red Sox are going to be scary good this year. The Red Sox are a consensus pick for first in the AL East. They are just so good all around, that I don’t think they can be upset by Baltimore or Toronto. It starts at the pitching staff. Yes, the same pitching staff that had David Price AND AL Cy Young winner Rick Porcello has somehow gotten better this year. Joining Price and Porcello this year is Chris Sale, acquired from Chicago this offseason for Yoan Moncada and Michael Kopech. Steven Wright, a knuckleballer, has put up consistent numbers through his first few MLB seasons. The bullpen will likely be led by Drew Pomeranz, who is a good two-way pitcher and could possibly end up in the rotation. Craig Kimbrel will definitely be the closer, one of the best fireballers in the league. The Red Sox’ weakness is at catcher, where big time bust Blake Swihart and Sandy Leon will be platooning. Xander Bogaerts is one of the best shortstops in the entire league, which is a huge plus for the Red Sox. Hanley Ramirez and Dustin Pedroia will excite Red Sox fans again this year. The outfield is young and exciting, with Jackie Bradley, Andrew Benintendi, and one of the best in the league, Mookie Betts. I wouldn’t be surprised if the Red Sox have a deep run this year, possibly to the World Series. Remember way back to 2012, when the Nats literally had to have a specially branded weekend to get fans to watch the Nats play the Phils at what was then nicknamed “Citizens Bank Park South”? Ha, they probably would have to do that at CBP nowadays. The Phillies are, well, no good at all. Jeremy Hellickson is the team’s ace. That shows how far the Phillies have fallen. Aaron Nola and Adam Morgan (not the neighborhood in DC) are the other starters who should be putting up semi-good numbers for the Phillies. The Phillies have some promising players, but it will be a while before they shine. The 2008 Phillies are now a long and distant memory. The Braves had a rough time last year. But this year, even after improving the pitching staff, they will fall to fourth in the east. Joining Julio Teheran in the Braves’ rotation is R.A. Dickey and Bartolo Colon, giving the Braves veteran help. Matt Wisler and Jaime Garcia are also good starters for the Braves. The bullpen is extremely unexciting, with Ian Krol and Jim Johnson leading the way at the brand new SunTrust Park. Kurt Suzuki and Tyler Flowers should make for a nice tandem behind the plate. The infield looks decent, with Freddie Freeman, Dansby Swanson, Jace Peterson, and new acquisition Brandon Phillips leading the way. They literally have only three outfielders on the depth chart (Inciarte, Kemp and Markakis), but lucky for them, they’re all pretty good. The Braves are going to be better, but they aren’t great at all. I honestly don’t want to put the Marlins here because they have the talent to be a first-place team. All they need is a star pitcher, and I feel terrible saying that. They lost Jose Fernandez in the worst way possible, as he passed away in a boating accident during last season. They do, however, have three solid starters, Wei-Yin Chen, Edinson Volquez, and Tom Koehler. The bullpen is anchored by one of the most underrated closers in all of baseball, A.J. Ramos. They also signed Brad Ziegler for the bullpen. J.T. Realmuto is the catcher, and he is pretty good defensively, protecting the fish behind the plate. The infield is full of talent. Dee Gordon is the best player, who I expect to have a crazy good season in the memory of Jose Fernandez. Justin Bour, Adeiny Hechavarria, and Martin Prado make up the rest of the very solid infield. The Marlins, like last year, have four outfielders competing for three spots. Christian Yelich and Giancarlo Stanton are guaranteed spots. The Marlins, I believe, would be so much better with a less cavernous stadium and their ace back. You probably saw the “W” and immediately clicked out of this article. And I am super sorry. I just don’t think the Nats are going to be so spectacular this year, especially with the rotation the Mets sport. Max Scherzer is the ace of the Nationals rotation, and will contend for another Cy Young award. Stephen Strasburg, Tanner Roark, and Joe Ross make up a very good rotation. The bullpen is the main reason why I believe that the Nats will fall to second in the NL East this year. In the past few years, the bullpen has come crashing down. Even with roles more clearly defined in the past few days, there’s still a lot to learn in the 2017 bullpen. The big question is can Blake Treinen close on a frequent basis? Another big question mark is how Matt Wieters will perform suiting up behind the plate for the first time inside the DC Beltway. I am excited to watch a full season of Trea Turner in a Nationals uniform and I expect big things from him. If the Nats don’t take home a consecutive NL East title, then lock them in for a Wild Card. I just don’t like the bullpen insecurity. This year, with a healthy rotation, it’s extremely hard to pick against the Mets this year. Noah Syndergaard, Jacob deGrom, Matt Harvey, Steven Matz, and Robert Gsellman make up a scary, scary rotation. Every night, no matter when you play the Mets, you will have to get past a very good starting pitcher. The bullpen doesn’t get any worse, unluckily for opponents. Jerry Blevins comes at you as the setup man, followed by none other than Jeurys Familia, the fireballing closer. Travis d’Arnaud and Kevin Plawecki make up a really good catching tandem. With Duda, Reyes, and Wright in the infield, and Cespedes, Conforto, and Granderson in the outfield, this looks like a powerhouse team. As much as it pains me to say this, I think that the Mets will come out on top in the NL East this season. THE CLEVELAND INDIANS ARE YOUR 2017 WORLD SERIES CHAMPIONS!!!!! Say what you will about 2016. There were lots of historical events, some good and some bad. But as we end the year, it’s a time to exchange gifts and celebrate with family and friends. So let’s take a look at these cool items for the 2016 holidays that will make perfect gifts. Prinstant Replays are really cool posters and t-shirts of the “greatest plays in sports history.” They cover every major American sport, and would make a great piece of art to hang in a man cave or bedroom. They feature a diagram of the play, the score, and a quote from the announcer. My favorite for Nationals fans is Jayson Werth’s 2012 NLDS Game 4 walk-off poster, it says on the top “It’s a game winning, season saving home run for Jayson Werth,” the famed words of Charlie Slowes. Stay tuned to my Twitter for a chance to win a couple of these awesome prints. You can also buy them online at prinstantreplays.com, and at about $30, they are relatively inexpensive. And right now they have a buy one-get one free special. This would make a great gift for any sports fan you know. Herndon, Virginia-based Mascot Books is a company that allows authors from around the world to submit ideas for books that range from cultural cookbooks to books about sports teams. The company publishes three really good books that feature baseball or the local team, the Washington Nationals. The first one, Trolley Dodgers, Pinstriped Yankees, and Wearing Red Sox, is a very interesting pitcure book about how MLB teams got their names and some interesting facts about the city they play in. The best part about it is that it is for young kids. Also for younger kids is a biography of 2015 NL MVP Bryce Harper, called Glory Days Sports Biographies- Bryce Harper. It’s a picture history of Bryce, and his journey from the College of Southern Nevada to the Major League level. For Washington football fans, there’s also a Kirk Cousins book. The third Nationals book I recommend is called Washington Nationals- A to Z and it is a history of the Nationals/Expos franchise featuring records, milestones, and important days. It’s for older readers. Stay focused to my Twitter to have a chance to win a copy of Trolley Dodgers and the Glory Days Sports Biography- Bryce Harper. But you can also find them online for purchase here. Skinit makes cases and skins to customize your favorite electronic devices from your phone to your gaming system. They come in almost any design possible, from the MLB to the NCAA to Hello Kitty. Amazon.com lists over 200,000 different Skinits in every design for every device! And even if your design is not on their website, you can customize one for yourself. I have a Nationals Skinit on my Playstation console and controller similar to this one (but mine is the Nationals’ alternate Stars and Stripes jersey in the picture to the left). You may be a little skeptical, but it’s actually very cool to see what your favorite devices look like after applying a Skinit to them. You can purchase these awesome cases and skins at skinit.com or on Amazon.com. Ballpark Blueprints are basically exactly what the name says: a “blueprint” of every MLB, NFL, and most major NCAAF stadiums, and even some arenas, soccer stadiums, and classic stadiums, as well. They make t-shirts and poster-size blueprints of the exterior and interior of the ballparks and stadiums. Click here to check out the whole selection and you will definitely find the one that’s right for you. (I happen to like these two   the best!). For my Twitter followers, I have a giveaway! I have an adult size small t-shirt of Nationals Park that I am giving away to one lucky reader. But even if that lucky reader is not you, you can order one of these awesome shirts for any stadium at ballparkblueprints.com (where the selection is a little larger, including bags, calendars and coffee mugs) or order on Amazon. Stance makes very cool socks and underwear that are officially licensed by the MLB and NBA. They have socks that represent every MLB team, and even some classic teams (like the Expos). You can even get some that pay tribute to MLB legends like Jackie Robinson or Nolan Ryan. If you can’t picture what I mean, take a look at a few examples by clicking on this link. Take it from me- a kid around my age (12) would love a pair of Stance socks with their team colors. You can purchase Stance socks with team logos at stance.com or browse them in all different images and designs here. Oyo’s minifigures and sets are back for 2016! The company, which makes little figures of sports players in the NFL, MLB, NHL, and NCAA along with vintage players, has updated their roster with Daniel Murphy and Trea Turner in the Nats’ festive third jerseys, and a limited edition Max Scherzer Cy Young minifigure. They also make limited edition items for the World Champion Chicago Cubs and AL Champion Cleveland Indians, as well as limited editions for all of the MLB award winners, like Scherzer. Buy yours today for the stocking at store.oyosports.com, or get them here. OK, this one is for all the real athletes! The Blast Motion Sensor is a sensor that you attach to the end of your baseball bat to track your swing and help you improve at hitting. This is a really neat tool. Using the Blast Motion sensor, you can see data about your swing speed, power, and swing direction so you can see the metrics of your swing. Think of it as Stat Cast in your bat! All you have to do when you get the sensor is to charge it, pair it, attach it, and swing away. Whenever you hit the ball, it gives the statistics to an app that you can view after your hitting session is over. Learn more about the sensor at blastmotion.com or buy it now using this link (about $145 with free Prime shipping on Amazon). They also make a $120 sensor for golf (to track your swing) and also one for basketball to track your shots, layups and dunks. In 2009, a guy chopping wood in upstate New York swung his axe. To him, it felt like swinging a baseball bat. He went to a sports manufacturer and they liked his idea. This gave birth to the Axe Bat, a baseball bat with a handle shaped like what you would find on, well, an axe. It’s become popular with many MLB players, such as Mookie Betts and Dustin Pedroia. They’re now made for hitters for all leagues, including youth and softball. Bats range from $300 for the 2017 HyperWhip Fusion model at the highest, to about $80 at the low end for youth size. A good middle of the road bat I like is the Element model. To view all of the bats, go to axebat.com. SKLZ is renowned around the sports world as a maker of great training equipment. The company makes equipment for soccer, football, basketball, golf, softball, hockey, lacrosse, rugby, tennis, and volleyball as well as baseball. As they say, you need more than a bat to improve your game. That’s why I’m recommending their batting trainer, for about $150. Online or in your favorite sports store, you will find all kinds of SKLZ baseball training equipment, including nets, contact baseballs, tees, and swing trainers. Finally, in the Under-$50 category is the Super Stadium table-top baseball game. It’s kind of an old fashioned pinball type game, but that’s what makes it a fun alternative to electronic games played on tablets and video game systems. This will keep smaller kids entertained, and even bigger kids too. The metal balls are surprisingly hard to hit with the lever. I had fun playing it with my brother. It was fun to actually interact with each other over the game. I hope you have a phenomenal holiday season. For Nationals fans, let’s send our wishes to Mike Rizzo, as we would all love if he made a splash for a Christmas miracle like Daniel Murphy last year. And for all other baseball fans, I hope you have a good winter offseason and that Spring Training comes quickly! Happy holidays to all my readers! I hope you like my 2016 Gift Guide. Remember to also check out my Gift Guides from 2015, 2014 and 2013 for other great recommendations. Please let me know in the comments or on Twitter which items you like best! On Thursday, the Cleveland Cavaliers and Donald Trump weren’t the only guests at the White House. MattsBats.com was there, covering the ceremony by President Obama and Vice President Biden honoring the 2016 NBA Finals Champion Cavaliers. Although my knowledge of basketball is almost as little as Buck Showalter’s knowledge on how to use Zach Britton in a high stakes playoff game, it was still fun to watch the President honor a team for possibly the last time. But in the middle of this, something odd happened- I was sort of detained by the Secret Service. Those five words put together might imply that I tried to hurt the President or Vice President. Nope. Here’s what happened. It was a very busy day at the White House. President-Elect Donald Trump, Vice President-Election Mike Pence, and Future First Lady Melania Trump were visiting. There were A LOT of members of the press on site. It was pretty chaotic. We had just finished setting up for the Cavaliers event. A White House staffer called for the media to leave the South Lawn and go back to the press briefing room and I followed the group back into the White House. As I walked back into the White House, a Secret Service officer with a rifle was watching the press walking by. He noticed that I didn’t have a press pass around my neck (when I checked in earlier I didn’t receive any credentials). The secret service officer yelled out to me “HEY WHERE’S YOUR PRESS PASS?” and he called me over. I (nervously) tried to explain how the security officer at the gate didn’t give me a pass and that my chaperone was still setting up equipment on the lawn. He didn’t buy my story and he escorted me to another area of the room. I stood in the hallway of the White House, nervously trying to figure out how I was going to get out of this situation without getting in major trouble. I wanted to text my chaperone to get help but I was scared to make any sudden moves. It was the scariest moment of my entire life. As I waited for more information, somebody famous walked out of another doorway and stood in the hallway next to us. I didn’t know who it was, but I could tell he was important because he was wearing a suit (with an American flag pin on his lapel) and he was followed by an entourage. I later figured out it was Ohio Governor and former Republican Presidential candidate John Kasich, who was also there for the Cleveland Cavs ceremony. But there I was, in the hallway of the White House, trying to get back to the Cavs ceremony. After a few minutes another White House staffer saw me standing there, with a nervous expression on my face. Thankfully, this guy, a member of the White House Press Office, recognized me and vouched for me that I was supposed to be there. I was soon released and reunited with my friend. The funny part is that this whole incident only lasted 5–10 minutes, but it felt like a lifetime. So one day in the future when I’m talking to my grandchildren about what I did in my childhood, I can tell them that I was once detained by a Secret Service agent. Fun day! The 2016 MLB playoffs, as you know, start tonight with the American League Wild Card game between the Baltimore Orioles and the Toronto Blue Jays. In this post, I’ll share my predictions on who I think will take home the hardware when the Fall Classic comes around. First of all, let’s look back to my predictions from before the season started. From the National League, I had 100% record, picking the Nats, Cubs and Dodgers to win their divisions. In the American League, I had the Blue Jays, Royals and Angels on top. The game is being played at Rogers Centre in Toronto, so the Jays will have home field at the huge stadium. However, the depth of the Orioles’ bullpen should be able to shut down the offense of the Blue Jays, and Chris Tillman should have a good outing tonight. Expect lots of big hits from both teams. This pick might not be popular with Nationals fans, but the Mets and Noah Syndergaard have a better overall roster than the Giants. The fall of the San Francisco squad in the second half shows that they aren’t playing at the top of their game, and I’m sure that the Mets will capitalize on that. However, it’s an even year, so the Giants always seem to be in the World Series. Home field advantage in this series will be key, which is why I am picking the Rangers. The Rangers don’t have as much pitching depth, but the presence of veteran hitters like Ian Desmond, who is very familiar with the Orioles, and Jonathan Lucroy, will help them take down the Orioles. In Big Papi David Ortiz’s final season, I think that the Sox should cruise to victory against the Indians. The Red Sox, led on the mound by Rick Porcello and David Price, with Ortiz, Mookie Betts (possible AL MVP candidate), and Dustin Pedroia in the batter’s box, should take down the AL Central champs Cleveland. It won’t be easy though, as I predict it will take 5 games for the Red Sox to win. In a rematch of last year’s NLCS, I think that the Cubs, who lost the battle last season, will be victorious this year. The Cubs had the best record in the big leagues by a large margin, and I think that they will beat the Wild Card winning Mets in this year’s NLDS. Wow, this is painful to say but I’m making an honest pick. I’m taking the Dodgers. I don’t feel that the Nationals can match the Dodgers’ depth in the field and on the mound, especially with Wilson Ramos and Stephen Strasburg being injured. Clayton Kershaw, Corey Seager, and Joc Pederson should take the Dodgers into the NLCS. I think it’ll take a full five games, though. The Red Sox should take the crown over the Rangers in the 2nd round, sending them to the ALCS. The Rangers have a good team, but I think that they won’t be able to overtake the Red Sox. The Dodgers’ run should end right here with a loss to the Cubs. Chicago is the all-around best team of the playoffs on paper, and I think that they should move on to the World Series with a win over LA. The Dodgers won’t go down without a fight, and I think it’ll take 6 games for the Cubs to defeat them. This may be as epic of a World Series as you’ll get, with the 2 “cursed” teams of the 20th century facing off. However, for the first time since 1908, I think that the Chicago Cubs will take the crown and raise the Commissioner’s Trophy as the best team in baseball for this season. They are just the best team of the field and will have no problem winning the World Series. Just don’t let any goats near Wrigley Field. What are your predictions? Tweet them to me @MattsBats or comment them down below. Over the last couple weeks, my family took a vacation to the wonderful West Coast cities of San Francisco and Seattle. Living here in DC, I don’t get a chance to watch too much West Coast baseball, but love the chances to see those teams play whenever I can. So it was great when we were invited by the Seattle Mariners to come to a game and go behind the scenes at Safeco Field. Safeco is a very nice ballpark. It actually reminded me a lot of the Rockies’ Coors Field, which we visited last year. I would definitely recommend a game there to anyone who is going to be in the Seattle area during the baseball season. The ballpark is celebrating it’s 17th birthday this year, but it still looks brand new due to impressive housekeeping. You’ll never have to worry about a rain delay in Seattle, as Safeco has a retractable roof that can open and close in 15 minutes. The people who work at the ballpark are probably the friendliest of any I have ever visited. There are lots of great food options, an interactive Mariners Hall of Fame, and it’s very easy to get to from downtown via the Link train. The Mariners have a great team this year, with stars like Robinson Cano, Kyle Seager, Nelson Cruz and Felix Hernandez. So now’s the time to go see the Mariners! Before the game, we stopped at a Mariners team store that was conveniently located right in the middle of downtown Seattle. That was a great convenience, and not something I have really noticed any other MLB team do. At the store, I got a Ken Griffey, Jr. shirsey that had a “patch” saying “2016 Hall of Fame Induction” on it. That was a great souvenir. Because we got to the ballpark at 4:30 to see batting practice and go on a backstage tour, the ballpark was almost empty when we arrived. But as soon as the gates opened to the public, there was a rush of fans to get inside. The M’s previous game the night before was a 15 inning roller coaster that the Mariners eventually won. Because of the late ending, the teams didn’t take as much BP as we hoped they would. We still got onto the field, and I got to take a picture with breakout 3B Kyle Seager. If you don’t follow baseball closely, you may have missed how great a player he is. He is in the same category of third basemen as guys like Nolan Arenado, Manny Machado or Anthony Rendon. Seager has a solid bat and made a spectacular defensive play later in the game, so it was great to meet him before the game. Also on the field, I talked with Aaron Goldsmith, a play-by-play announcer for 710 AM ESPN Seattle and Root Sports Northwest. Aaron gave me a lot of great tips about how to be a broadcaster, which is what I would like to do when I grow up. He showed me his custom scorebook, where he puts stats and notes to use during the game. Aaron said that his scorebook was actually based on the Bob Carpenter one, that many broadcasters use to keep score. He encouraged me to keep writing, as that’s the best way to describe games in colorful images for people who are not there with you to see it. After Mariners finished BP, the grounds crew took down the cage, because the Tigers decided to take BP inside. That’s when we went inside to start touring the ballpark. First we went into the interview room, where Rebecca Hale, the Marniers’ Director of Public Information, actually interviewed me for the M’s radio network about my experience writing MattsBats.com and visiting Seattle and other ballparks. The interview aired before the game on Sunday, Aug. 21 versus the Milwaukee Brewers. Listen to it below! After the interview, we went up to the press box. We looked out the window of the press box over Safeco field and picked up the game notes and scoring sheets. It was a perfect view of the field, not too high up. We saw where some foul balls came into the press box and dented the walls. And during the first couple of our game, we actually saw two balls fly into the press box. Getting baseball broadcasting lessons from Aaron Goldsmith up in the broadcast booth. Upstairs from the press box are the broadcast booths. We first went into the radio booth, where we met up with Aaron again, and then we saw Rick Rizzs, the play-by-play announcer for the M’s radio since the 1980s. Rizzs was legendary Mariners broadcaster Dave Niehaus’s partner from his beginning with the franchise to when Niehaus died in 2010. Now the press box is named after Niehaus. Rick gave me some great tips on how to be a broadcaster and we talked about how much baseball information is available on the internet now compared to what was in the thin little media guides 20 or 30 years ago. A broadcaster, like a player, needs to work your way through the minors in order to eventually land a gig on the MLB level. He thought it was great that I started writing when I was only 8 years old. The voices of the broadcasters travel very far, I learned, as the Mariners’ broadcast territory extends all across the Pacific Northwest (Washington, Oregon, Idaho, Montana), as well as the two non-contiguous states, Alaska and Hawaii. Compare that to the teams I’m more familiar with on the East Coast, where there are the Nationals, Orioles, Phillies, Mets, Yankees, and Red Sox all within 450 miles on I-95– not to mention the Pirates and Blue Jays all within a few hours’ drive too. After visiting the radio booth, we went over to the TV booth, where we met with the TV voices of the team, Dave Sims and Dave Valle. They were very friendly and told us a lot of interesting things about their jobs. I pointed out where Bryce Harper hit the glass at Safeco below the “Hit it Here” sign deep in the outfield. (See video here). We talked about different press boxes around the league. The press box at Nationals Park is really high up, as is the one in Pittsburgh, which is the highest in MLB. I’ve been in both of those press boxes. We talked about how hard it is to tell at that level if a fly ball is a home run or just a regular can of corn. You have to watch the outfielders react, and really try to get to BP to see how the ball comes off the bat. The two Daves also pointed out their bulletin board with the text of the advertisements and promotions that the announcers read during stoppages of play. I found that very interesting. They joked that reading the ads correctly was the most important part of their job. Finally, we went into the Master A/V Control room. The entire scoreboard is one HUGE video board. The team has a control room that looks like a TV studio and it controls the music, visuals, and PA systems throughout the ballpark. My five year old sister was walking around the control room, and got dangerously close to the microphone. Knowing my sister, I thought she was going to speak into it, but luckily she didn’t! Interestingly, the room is not noisy and chaotic during a game; it’s actually very quiet because everyone is busy working and wearing headphones. That ended our behind the scenes tour, but was just the start of our night at the ballpark. But before we sat down, we walked once around the whole stadium. For dinner, I decided against my normal hot dog for a Seattle classic, Ivar’s Fish and Chips. While walking around the stadium, we also stopped by the Moose Den to take a picture with the Mariner Moose. When we got back to our seats, we noticed there were, coincidentally, Nats fans sitting right behind us. We talked with them a little before the game started, and then saw them the next day at the EMP Museum below the Seattle Space Needle. The game we saw was a good old-fashioned pitcher’s duel: former Cy Young winner for the Detroit Tigers, Justin Verlander, versus fomer Cy Young winner “King” Felix Hernandez for the Mariners. Since it was Hernandez’s start, a section in left field was made into the famous “King’s Court” for the game. All the fans in that section get a yellow t-shirt and “K” sign to wave. Whenever Hernandez had 2 strikes on a batter, the fans in King’s Court (and really anywhere else) chanted “K! K! K! K! K!” to try to distract the hitter and get Hernandez the strikeout. It’s really neat that the team does that, but having only seen the King’s Court on TV, to behold it with my eyes was amazing. (We were even given King’s Court t-shirts by the Mariners as a gift when we arrived). I added to my collection of Mariners merchandise by buying a cap, which of course I had to wear backwards like recent HOF inductee Ken Griffey, Jr. The Tigers went down in order in the top of the 1st, but in the bottom of the first inning Robinson Cano drilled a 1-2 Verlander changeup over the left field fence and beyond the reach of the left fielder Justin Upton. But in the top of the 4th, J.D. Martinez drove in Ian Kinsler with a single, tying the game at 1. Verlander and Hernandez were solid for the next couple innings, and after the 6th inning. The two starters threw about 100 pitches each in a 1-1 match up for about 6 innings. I was hoping former Nationals closer Drew Storen, now in the M’s bullpen, would make a relief appearance, but he didn’t. In the bottom of the 8th, Nelson Cruz hit a bomb off Justin Wilson to give the Mariners the lead back. Also in that inning, Leonys Martin gave the bullpen some insurance, singling in front of the left fielder to drive in Kyle Seager and make it 3-1 Mariners. In the bottom of the 9th, Nick Vincent had a solid inning, retiring the side having to face only 4 batters and lock down another win for the burning hot Seattle Mariners. This win boosted their win streak to 7 games. It was great to catch the Mariners on a hot streak, and to see them “Cruz” to victory off of Nelson’s boomstick. Overall, I think that Safeco Field is a very nice ballpark for baseball fans to visit. The staff is very friendly, the food options are very diverse, the history of baseball in the Pacific Northwest is very well described, and there are many baseball-themed activities for kids (something you can’t find at most ballparks). It’s an interesting-looking ballpark, unlike some of the plainer ballparks in the league (like DC’s). I found a reason to become a fan of the “other Washington” ballclub, and I’m glad I did. You can bet I will be tuning into more Mariners baseball games whenever I can! And I look forward to the Nationals playing the Mariners next season in interleague baseball! I recently had the amazing opportunity to interview the Commissioner of Major League Baseball, Rob Manfred, about his new youth baseball initiatives. Ever since taking the reins as Commissioner in 2015, Manfred has done a great job encouraging young kids to try out our National Pastime to become fans for life and future players of the sport. This season, with the exciting new launch of the Play Ball initiatives, I was lucky enough to talk to him about the state of the MLB’s youth initiatives. Matt’s Bats – Can you please briefly explain Major League Baseball’s youth initiatives and why the league is working on this? Rob Manfred – All of our youth initiatives are under the umbrella of Play Ball. We have programs designed to reach all sorts of kids, including softball programs, baseball programs, and programs to revive baseball in the inner cities, which are grassroots programs in under-served communities. The MLB Youth Academies and the League Development Invitational are designed for kids who may have a future as professional or college players. It’s an across the board approach to try to get kids of all levels playing the game. MB – How do you think these programs will help get kids back into baseball? RM – Play Ball has a focus on simpler ways to engage with the game. One of the impediments to kids playing baseball is that people think you need 18 kids in uniforms and an umpire. We want kids playing the game in a simpler way, whether its Wiffleball, Hot Box, catch, or Home Run Derby. There are a lot of simpler games kids can play that are enjoyable and athletic, without needing 18 kids on the field. MB – These programs can also encourage kids from inner cities that might not have the field space to play a true baseball game, to play games that are like baseball. Why did you reach out to Ken Griffey, Jr. to lead the initiative as an ambassador? RM – Two reasons. First, star power drives kids’ interest. Junior was probably the greatest player of his generation. He has a wonderful personality and an infectious smile. Second, since his retirement he has shown a lot of interest in youth baseball. He has a long relationship with the Boys and Girls Club. We thought he was the perfect ambassador. MB – I’m a Nats fan, so I was really excited to see the support of former Expos player Marquis Grissom too. RM – Marquis runs a great program in Atlanta. Our former players are a huge asset helping kids more interested in baseball. They know and understand the game better than anyone. They are passionate about engaging kids because they believe its the future of our game. MB – What life lessons can baseball teach kids? RM – First, teamwork. There’s no sport that’s more of a team game than baseball. No matter how good you are, if you don’t have good teammates around you, you can’t win. Second, the ability to overcome failure. Baseball is a very hard game. The best hitter only succeeds 1 in 3 times and you need to be able to work from your failure to be more successful next time you’re up. MB – Why are the league’s youth initiatives so important to have now? RM – The competition for youth players’ time is greater than ever before – there are a lot more sports choices they can make. Each and every sport is trying to get kids to specialize in only one sport, which only increases the competition. Baseball needs to make sure it is putting its best foot forward. MB – On a different subject, Major League Baseball is obviously a men’s league, but when do you think there will be a woman on the field in an MLB uniform, maybe either as an umpire or coach? RM – I think its really important that our on-field personnel, players, coaches, and umpires, reflect the diversity of our fan base and I’m hopeful that we’ll have a woman on the field in some capacity in the not too distant future. MB – Finally, when is the next big youth baseball event that the league is sponsoring? RM – There will be an exciting announcement up in the Bronx, opening a new MLB Academy at Roberto Clemente Park. [MLB announced the opening of the Academy on Wednesday, July 20, 2016, the day after this interview was conducted]. The opportunity to have an Academy at a park named for one of the game’s greatest stars is a really exciting one. As you can see, there MLB recognizes the importance of getting kids involved in the sport of baseball. Since I am such a fan of baseball and write about my experiences with the game through the viewpoint of a kid, I was very happy to hear about Commissioner Manfred’s plans for the future of the sport. Keep reading my MLB Pro blog MattsBats.com and follow on Twitter and Instagram. I’m going to be covering a lot of cool things this summer–including I’LL BE AT THE WHITE HOUSE TODAY AS PRESIDENT OBAMA WELCOMES THE 2015 WORLD SERIES CHAMPION KANSAS CITY ROYALS.